Above: Dixie Boyle walks with Bouba at Quarai, part of the Salinas Pueblo Missions National Monument. Photographs by Marilyn Conway. FROM MY PERCH IN THE Capilla Peak Fire Lookout, atop the Manzano Mountains, I can scan a landscape that provides a quick study in New Mexico history and geography. To the south, there’s Sierra Blanca, near Ruidoso, and Capitán Gap, where Smokey Bear was found. Turning west and then north, I spot the Río Grande Valley; Old Baldy, in the Magdalena Range; the Oscuras, close to where the first atomic bomb exploded; Mount Taylor, near the uranium mines; the Sandía and Jémez Mountains; and the Sangre de Cristos, near Santa Fe. On the far eastern horizon, I can just spy the Llano Estacado, the “staked plains,” once the hunting grounds for roaming Navajo, Apache, and Comanche bands. Nearer to me are the salt lakes that the Tompiro, a now extinct Pueblo group inhabiting both Abo and Gran Quivira, mined for centuries while establishing salt-trade routes to Taos and Mexico City. The old pueblos of Abo, Gran Quivira, and Quarai were inhabited until the 1670s, but to me, they also mark the boundaries of my home—the town of Mountainair. It’s a place I couldn’t wait to leave when I graduated from high school in the 1970s and began my vagabond years as a forest fire lookout, history teacher, newspaper reporter, and museum curator. Little did I know that not only would I find my way back to my small town, but I’d fall in love with it and its rich cast of characters. From discovering the story of a woman who helped preserve Gran Quivira as part of the national park system to wandering the booths at the annual Sunflower Festival, Mountainair has settled into me as much as I’ve settled into it. This is the story of my hometown and how I decided to stay. In the 17th century, drought, starvation, and Apache raids forced the people near Mountainair to abandon their homes. The survivors integrated with other tribes. Their buildings and those of the Spanish Colonial friars soon began to crumble. But for one woman, they might have disappeared altogether from our cultural landscape. When Clara Corbin and her husband, William, homesteaded Gran Quivira in the 1890s, they were looking for a vast treasure they had read about and hoped to find in the abandoned ruins. After William died, Clara pursued her ownership claim all the way to Washington, D.C.—which brought the ruins to the attention of the American public and resulted in their ultimate preservation. Founded in 1903, Mountainair sprang to life and prospered as both a railroad town and a farming community once known as the Pinto Bean Capital of the World. At its height, some 3,000 people called it home. Along its streets, they crafted buildings that included a majestic brick bank adorned with intricate tin ceilings. There was the Tabet Bar & Texaco Station, Lawson’s Department Store, Hail Equipment Company, and Town Pump Bar. In 1923, folk artist “Pop” Shaffer built the Shaffer Hotel and decorated its garden walls and sidewalks with his quirky rock mosaics. A registered national historic site, it’s a rare example of Pueblo Deco architecture. Even as a child, I loved driving past it in the evenings when the walls of the lobby were lit up, showing old photographs and historical memorabilia surrounding a large, black-and-white photograph of Marilyn Monroe. By then, though, Mountainair had become a shadow of itself. In the late 1920s, the rains had begun to taper off, followed by the Dust Bowl years of the 1930s, with continuing droughts into the 1940s. Most of the farms failed. Highways replaced trains, and people moved elsewhere to find jobs. The shops they supported eventually closed. I saw buildings on Mountainair’s east end slowly disappear—some to fire, others to razing. With the vanishing buildings, the history of the town was leaving, too. Who would save it? Not me, I thought as I packed my bags. For 20 years, I wandered from one Western state to another, along the way adapting to the life of a fire lookout. I logged my first season at Bearwallow Lookout, in the Gila National Forest, and went on to work as the relief lookout on the Magdalena District before relocating to eastern Oregon and working two lookouts for Oregon State Forestry on the edge of the Great Basin. I spent 14 years spotting fires in the Black Hills National Forest, in Wyoming and South Dakota. I fell in love with magical landscapes and, in the off-seasons, taught history courses and interpreted history at various museums. But in my heart, I was surprised to feel a longing for home. In 2002, I found work with the local fire district, and then started putting to use the skills I’d developed in researching other states’ histories. What I discovered was something I had carelessly left behind. My eyes opened to a past rich in stories and a community of hardworking people devoted to the survival of their town. I searched for faded photographs and found old-timers who entrusted me with family albums and historical files. I published books and articles and even had a radio show, Archaeology and History in Your Backyard. The sometimes lonely life of a fire lookout suits me perfectly, particularly because it leaves plenty of time for reading, researching, and writing. I love the solitude and observing the wildlife, the weather patterns, and the changing colors and seasons. From early spring until summer monsoons, I scan the landscape between bouts of research in the peace of my temporary mountain home. It was there that I learned enough about Clara Corbin (see “A Life in Ruins,” nmmag.us/clara) to begin portraying her in reenactments of her life and time at Gran Quivira—a place that’s been a favorite of mine since childhood. Even now, I enjoy walking through the ancient pueblo and absorbing its fascinating yet tragic history. I have often sat atop Mound 7, the highest point of the partially reconstructed pueblo, and gazed at the distant peaks, much as the Tompiro people did centuries ago. Like me, other Mountainair residents haven’t given up on this town of 1,000 people. 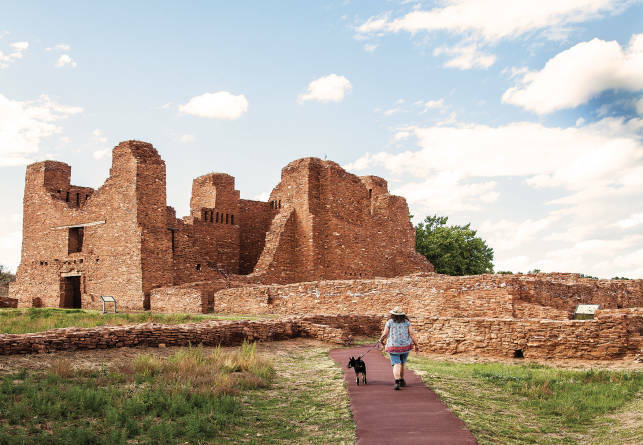 The “Gateway to Ancient Cities,” Mountainair encourages visitors to see Gran Quivira, Abo, and Quarai—the three parts of the Salinas Pueblo Missions National Monument. Thanks to its proximity to national forests, Albuquerque, and Santa Fe, we also attract artists, writers, retirees, and free thinkers seeking a slower and alternative lifestyle. A group of artists established the Manzano Mountain Art Council in 1995. It purchased the historic Mountainair Trading Company and converted the building into a flourishing art center for classes, studios, exhibits, lectures, yoga classes, after-school programs, and musical events. My hometown is truly steeped in history, something I failed to fully appreciate as a teenager. Today, when I walk Mountainair’s main street, I see colorful mosaics and murals, renovated buildings, and neighbors who share my love of history. For us, this is the place to experience culture, history, and home. Mountainair nestles in the southern foothills of the Manzano Mountains, about an hour southeast of Albuquerque. Its attractions include the Salinas Pueblo Missions National Monument, with three sites—Abo, Quarai, and Gran Quivira—that can be visited in one long day or broken up over several. Get your bearings at the visitor center in Mountainair (102 S. Ripley St., 505-847-2585, nps.gov/sapu). The annual Sunflower Festival kicks off 10 a.m.–4 p.m. on August 25. Besides sunflowers and a sunflower-hat contest, you’ll see local artists, vendors, and live music (manzanomountainairartcouncil.org). The cooperative Cibola Arts Gallery showcases local makers and has free maps of downtown’s mosaic murals (217 W. Broadway, 505-847-0324, cibolaartsgallery.com). Enjoy a meal at Jerry’s Ancient Cities Café (511 US 60, 505-847-2368), Alpine Alley Café (210 N. Summit Ave., 505-847-2478), B Street Deli (204 W. Broadway, 505-847-2223), the Bakery at Mountainair (217 W. Broadway, 505-847-1415), or the Last Chance Food Shack (108 W. Main St., 505-847-5092). Save room for a treat from the old-time soda fountain at Mountainair Meds and More (111 W. Broadway, 505-847-0202). Currently closed, the Shaffer Hotel nevertheless deserves a walk-by visit to marvel at its architecture and rock mosaics (103 W. Main St.). Numerous campgrounds lie within a short drive of the town. Local lodgings include the Rock Motel (901 US 60, 505-847-2577, therockmotel.org) and Turner Inn and RV Park (503 E. Broadway, 505-847-0248, turnerinnandrvpark.com). Two Ponyz Ranch has a guest casita near Abo, with room for your horse (off US 60, 505-847-0245, twoponyzranch.com).